I'm not sure my mum really gets this blog. I thought she might given that she used to be a chef and ignited my love of cooking many years ago, even if that love laid dormant for many years. But staying with her this weekend, I've repeatedly said 'I need to cook something new today' and she's just looked at me rather bemusedly and carried on cooking. So what to do? I have a fondue set at home I bought when I first left home and its never been out of its box because I was led to believe there was a dark art to the world of fondue making. 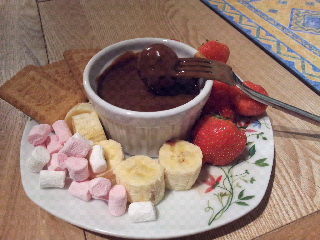 But where chocolate fondue is concerned, a quick Google revealed its just a runny ganache. In a nutshell (recipe from FoodNetwork.com) bring 150ml double cream to boiling point. Stir in 100g chopped chocolate until combined into a silky-smooth sauce. Add 50ml amaretto or other booze of your choice. Serve with chopped fruit, marshmallows and shortbread biscuits or cubes of madeira cake.